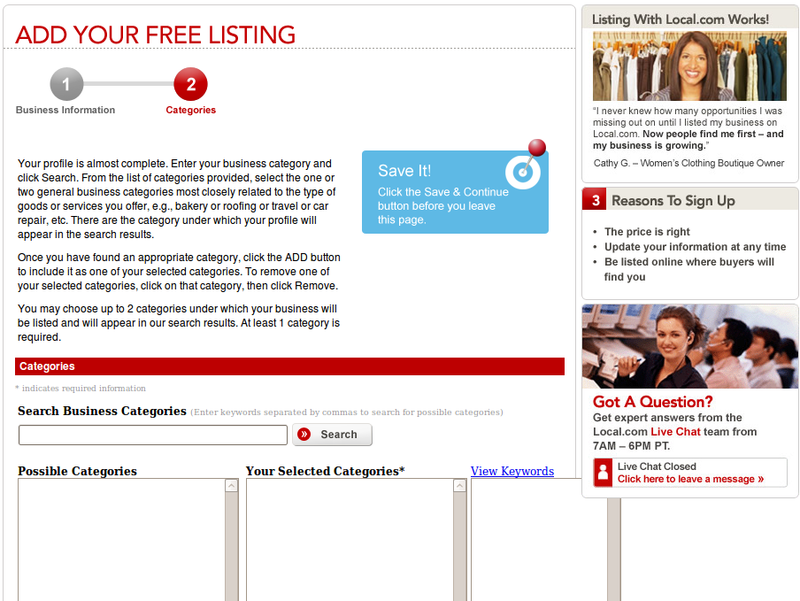 This is the fourth in our series of step-by-step how-to add your business to free Local Search Directories. See the links at the end of this post to locate the first three in the series. 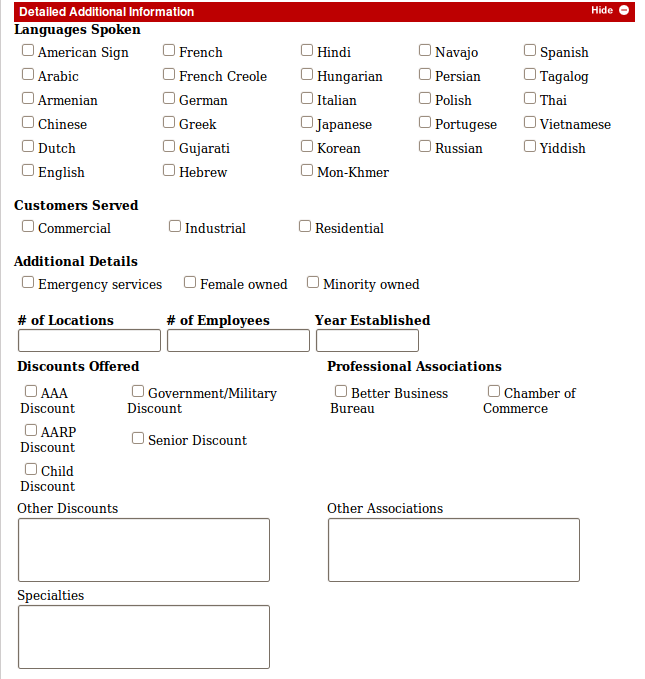 If you use our Local Search form to gather your business information you will have everything you need for each directory. Phone numbers will auto-format as you type. Use numbers only (their system adds parentheses around area codes). You can only choose TWO categories so be sure to select carefully. If you need assistance they offer Live Chat from 7 a.m. to 6 p.m. PST or you can phone them at (888) 857-6722. Most likely they are available the same hours for phone assistance as they are for chat. 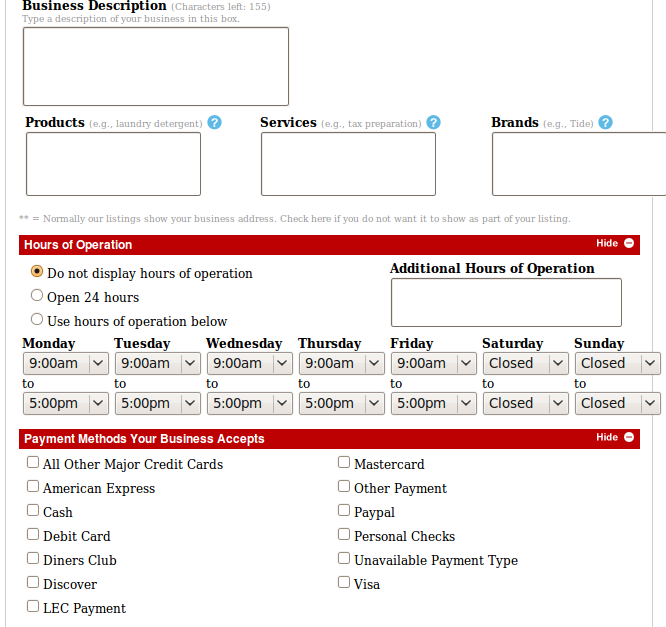 The screen captures below show the information requested. 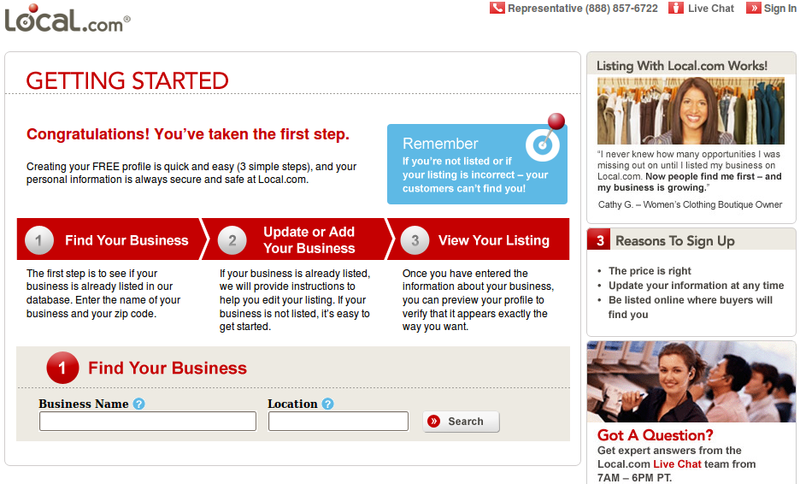 Some images including the one that offers the paid upgrades can be clicked on to open the actual Local Promote page. Nice series of posts. Found out some new sites to submit to.SEO wise you don’t have to spend too much time with directories and such. But for getting leads/traffic it is still quite valuable. Nice series of posts. Found out some new sites to submit to. SEO wise you don’t have to spend too much time with directories and such. But for getting leads/traffic it is still quite valuable. Thanks for explaining each steps with graphics, it’s much useful and easy to understand how to make the account in Local. Nice.. Indeed, Web Directories should be always included in seo strategies. It’s proven very effective increasing a sites PR. .-= Google Local Searches´s last blog ..Google Local Search as a Marketing Tool =-. Just as there are many search engines besides Google (Yahoo, Bing, DuckDuckGo, Zuula, etc.) 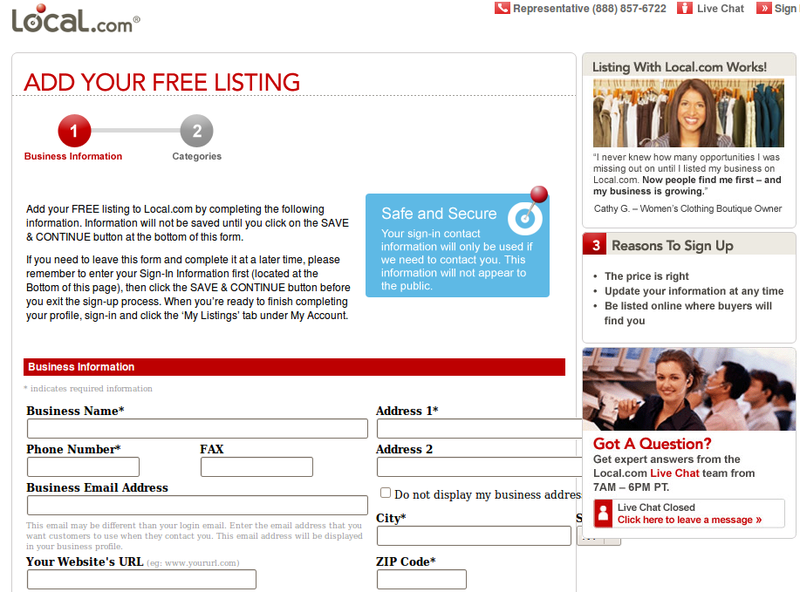 there are many local search directories and databases besides Google Local including Local Promote. Since a business can not control which search engine or directory their potential clients will use it makes sense for them to get listed in as many of them as possible if they wish to maximize their traffic and sales. Its sad that people still are not aware of the benefits of local directory listings and their contribution to your SERPs. This tutorial is really helpful and I always wanted to get a listing which is highly essential for my niche of business. .-= Mack@Homes in Las Vegas´s last blog ..Commercial Real Estate Bubble =-. After checking this post i just thought of adding my business to t Local.I encountered a problem as i had entered all the information required except the phone number field.I am unable to enter the 10 digit number. .-= Martin@HR Outsourcing´s last blog ..Why Silverlight in Web 2.0 ? =-. I suspect most Local Search directories are intended for U.S. businesses so they may not accept phone numbers or addresses in the formats used in other countries. If a business receives calls from the U.S. they may want to acquire a U.S. based phone number. Many thanks. I think I like it here and will be visiting again. Well it’s been quite a roller coaster ride here in the UK wedding business but I’m seeing plenty of light as well. Budgets are down but enthusiasm is still sky high. I’m photographing 2 weddings this weekend. The camera bags are packed and ready to go. There are absolutely stacks of free directories here. The cumulative effect is really worth the effort. I also notice a strange effect. Some of the ones I signed up to several years ago give me quite a tidy back link, even though they are quite small sites, so I guess Google likes old links? Maybe? I didn’t really think about my long-term strategy back then in 2001 but I do now. Back then Google was no more important than any directory and if people wanted to know my website address, I wrote it down for them on a bit of paper ? I was on a lot of directories and when Google came to dominate I was at top spot on my key words. It all seemed so easy. Then I got caught napping, whilst the World changed. The one that really used to work was Yellow Pages. It’s rebranded as Yell.com but I still have printed ads in the old directories that people keep forever. Unfortunately I am still getting bombarded with calls from retirees who still use a 2004 directory and want old pictures retouched and reprinted. As I had a good ad’ back in the day, they call me, assuming that a wedding photographer can sort them out. I can, I find out where they live and direct them to their nearest professional lab but it’s a freebie of course. I’ve had some trouble signing up to some American directories. 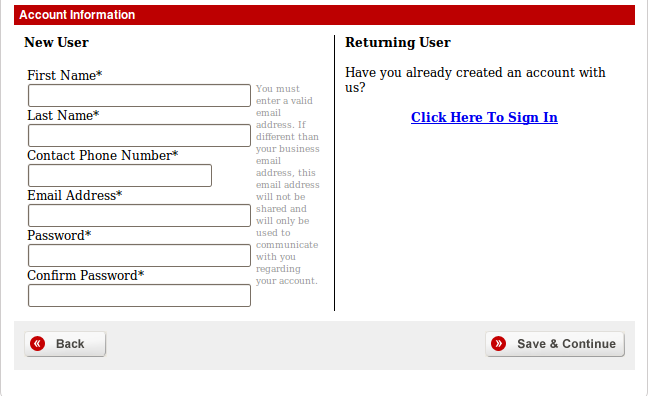 My telephone number and my postcode are both too long, so I don’t get past the initial stages of registration. My postcode is NG8 5FG and my telephone number is UK (+44) but just starting here: (0115) 8770609. It’s a bit too long for the data fields in some places. I’ve been finding Freeindex pretty useful . And local classifieds, such as Gumtree and certain newspaper classifieds, such as the Sun. Thank you for taking the time to share what you know with us. I especially appreciate it when someone shares what is working for them. Some will not take action until they are sure it will work – and hearing from businesses that are having success improves the potential that they will act. You are absolutely right that search engines including Google weight old links heavily in their algorithms. All other things being equal they will favor the older Web sites and links over the newer ones. 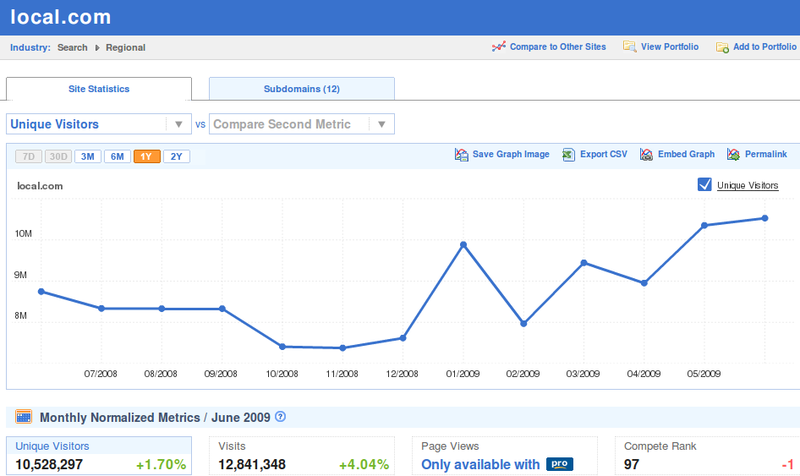 Longevity is a good way to improve search engine position. I see that Yell.com is UK specific. The various incarnations of the Yellow Pages keep changing here as well. Even though I almost always use online directories today I still recommend keeping a printed one around. Some don’t seem to realize the power could go off or batteries in your PDA, blackberry, etc. might be dead. I suspect that many directories are US centric and have not yet investigated which accept non-U.S. businesses. I know that many will not have fields that accept addresses and phone numbers as they are formatted differently in various countries. You may want to check out the business communities like Yelp and Merchant Circle as some are reporting excellent results from using them. I am always researching and working on organizing processes for managing and tracking various strategies so I do hope you’ll become a regular here. Check your Twitter account to see what else I do with the Twitter ID field in the comments here. this is great to read this. wonderfully described.its gonna help me a out. I wanted to check out the Webinar software you linked to but the site isn’t available. Most of the Local Search Directories I’ve covered so far do get tons of traffic. That is why I don’t understand why so few businesses are taking advantage of the free advertising they provide. Do check out the others and if you subscribe here you’ll benefit from the process I’m working on for tracking your listings and also a short-cut I just found to get you listed in many directories much faster. Informative, i have sure learned a few things from it. Tell us about Friendster. Why do you use it? What has it done for you either personally or for business? Glad you’re learning new strategies. The best thing about reading here now is you can still get direct answers and I can work with individual businesses directly. Where else can you get free answers to specific usability and marketing questions almost right away? How’s the wedding business in the UK? You’re in a great niche. No matter how the economy is people will still want to get married and who wouldn’t have photos taken? Be sure to check out the other Local Search Directories starting with the one featured in the Comment Luv link in this reply. The infoUSA database feeds other major directories. I would love to know which Local Search Directories are useful to businesses in the UK. Would you mind sharing what you’ve learned about them so far? I’ve been using on-line directories for quite some time and found them a good way of promoting my site, as in my opinion they produce good back links. One of the SEO blogs I read yesterday claimed that links from directories don’t help your ranking or search engine placing. This flies in the face of my experience. What do you think? Also, what happens if I put my twitter ID in the comment box? How does that work? There are many businesses and SEO/SEM companies that report adding businesses to Local Search directories improves their organic listings sometimes almost overnight. I suspect those who believe they don’t help are assuming that because some of these links seem to be nofollow they should not help. My experience is that they do. Any owner who searches on their business name will see listings from these directories so nofollow or dofollow they DO get indexed and they do count as incoming links. What happens when you put your Twitter ID in that field (just the UserID without the @ symbol) is that the plugin creates a hyperlink directly to your Twitter account so that I and anyone else who chooses can easily come find and follow you there. It also “automagically” adds that information to any previous comments you have made in the blog using it. Thanks for the info. I’ll use the local.com. .-= Hangelbel´s last blog ..How Does An Affiliate Marketer Earn Money Online? =-. Yet another installment in a great series of articles…..thanks for the update! My intention is to create a post for each Local Directory and then pull them all together in a process. I’m building a spreadsheet w/ hyperlinks any business can use for tracking their listings. that was unique info, but are those promotions for free, are those Local search directories same effective as that of Google PR, i think this for Home users and not for professional, whose only earning source is Affiliate marketing. .-= Mark Slater@healthy life tips´s last blog ..Healthy Living: Gaining Maximum Benefits =-. 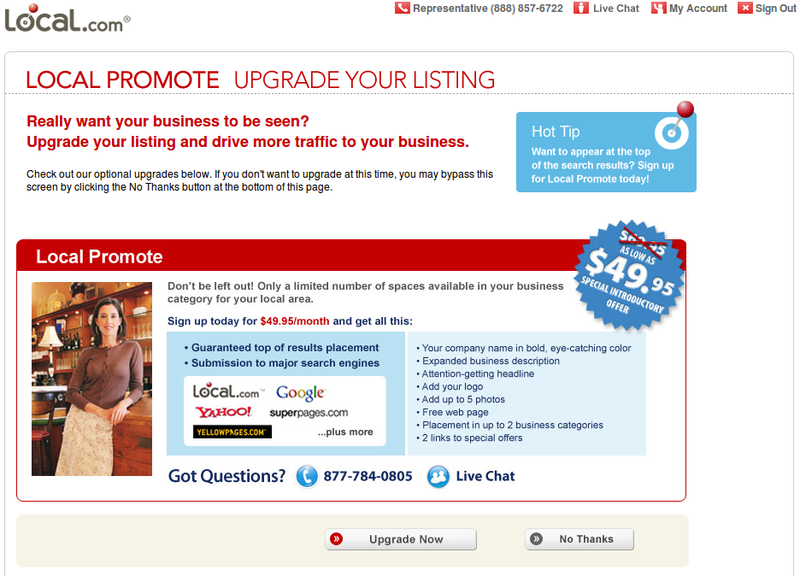 The Local Search Directories I recommend all have free options and many also offer upgrades for which there are fees. Think of them as online yellow pages (printed phone directories). Any business with a physical address can benefit from getting listed in them. The directories are often high Google PR sites so incoming links from them carry more weight with Google and can improve search engine position. Some provide databases to other directories; others have high online usage. Either way it doesn’t make sense to ignore a free way to get more potential customers.